I’ve got a busy weekend ahead and am busy making some new creations for the occasions. 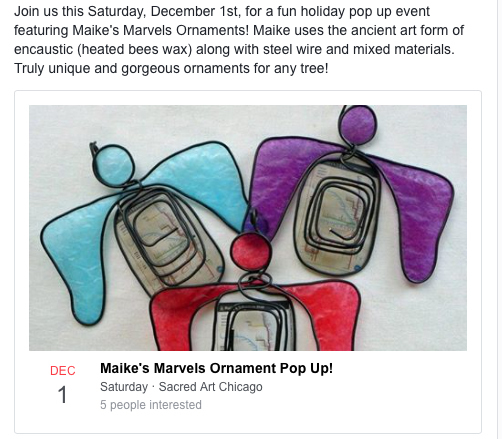 On Saturday Sacred Art Chicago is throwing me a “Maike’s Marvels Ornament Pop Up!” party so you can get your tree-trimming on. 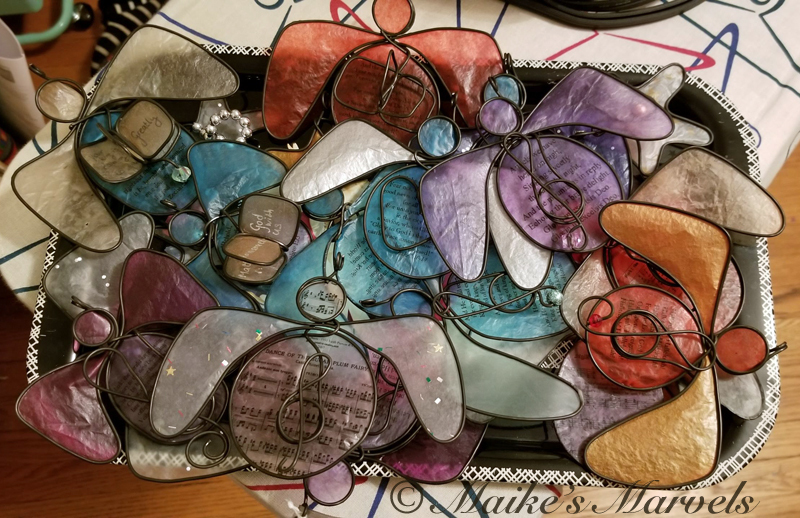 I will bring my full array of ornaments and have them available to you Saturday, December 2, from 1 to 3 pm. Think of it as a tree-trimming party. 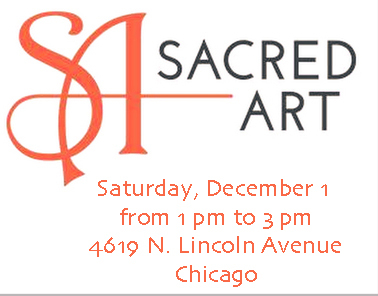 Sacred Art Chicago is Located at 4619 N Lincoln Ave, Chicago, Illinois 60625. They already have some Chicago-specific pieces and may hold on to a few of my newbies for the holiday season. You’ll have to pop in to find out! I cannot leave them with all my work, since on Sunday I am making my last Elmhurst trip of the year. 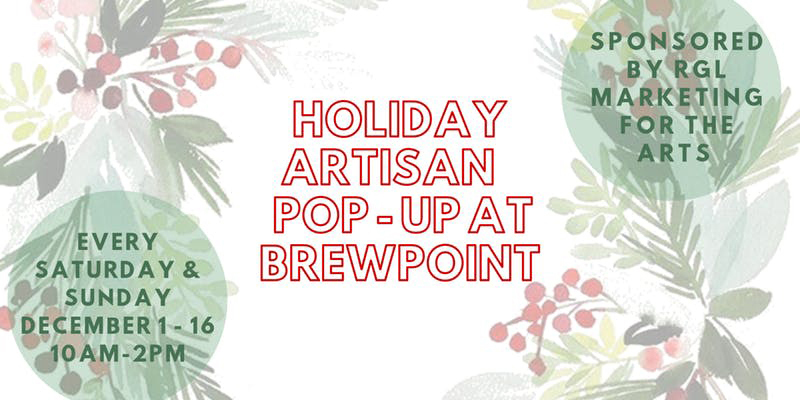 Every weekend in December Brewpoint Workshop & Roastery is hosting an artisan pop-up shop featuring various artisans. You can buy local gifts WHILE getting your coffee fill. The pop-up shops are sponsored by RGL Marketing for the Arts. I will be there December 2nd from 10 am to 2 pm. I am sharing space with Beth Chiappeta with Cookies for Kids’ Cancer. This Bakery raises funds for research to develop new, improved, and less toxic treatments for pediatric cancer. 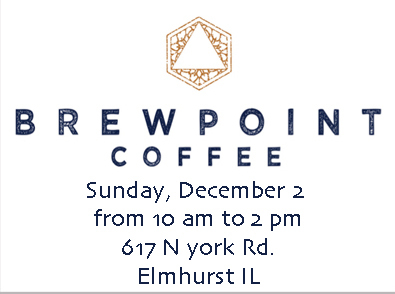 Brewpoint is located at 617 N York Rd. in Elmhurst Illinois, and there are fun things to do nearby. It’s worth a little trip into this suburb. I love the art museum and the Lizzadro Museum of Lapidary Art just blocks away from Brewpoint’s location. Don’t have time to pop by this weekend? I’ll also be at the Bucktown Holiday ArtShow December 8 & 9 and at the DANK Haus Weihnachtsmarkt December 14 & 15. See all events and consignment locations at my exhibits page. This entry was posted in art fairs and tagged Brewpoint Coffee, Chicago IL artisan, Elmhurst IL, holiday ornaments, IL Expo Holiday, Lincoln Square, Lincoln Square gift shop, Ornament Trunk Show, RGL Marketing for the Arts, Sacred Art, Sacred Art Chicago, Shop Handmade, Things To Do In Elmhurst, Tree-Trimming Party.